THIS IS FROM BLACKFIVE TODAY. HE SAID IT SO WELL AND I’M RUSHED FOR TIME TODAY, I THOUGHT I’D JUST PUT THIS UP… HOPE YOU DON’T MIND, B5! We have a great venue for our conference, the AED Conference Center. To pay for that venue, the National Hidden Heroes Foundation has agreed to donate up to $5,000 worth of proceeds from an innovative project they are currently working on. Recently, singer Barbara Fairchild recorded a very touching song dedicated to the Hidden Heroes, those who are left behind, the families of deployed troops. Many of us are aware of the sacrifices made by the families of our troops. These families serve their country too, quietly and with incredible dignity. Barbara's song, The Hidden Heroes, will be paired with a flash video presentation to be created by Todd Clegg, an example of his work can be viewed here (sound file). When the flash presentation is ready, it will be offered for download for a minimum contribution of $1. 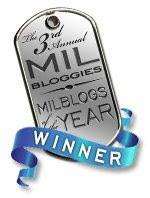 Contributions over $1 will be donated to the Milblog Conference. 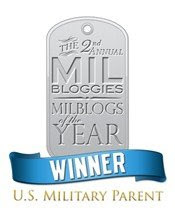 The first $5,000 will help pay for the Milblog Conference. You can go ahead and make your contribution today, and when the download is available, you will be notified by email.